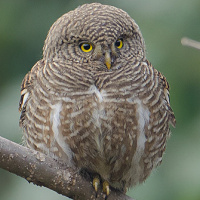 The Asian Barred Owlet is small owl with a rounded head and no ear-tufts. 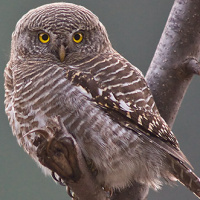 It is also known as the Cuckoo Owlet. Typical calls - Huai Kha Khaeng Wildlife Sanctuary, Thailand. December 2014. CC Marc Anderson. Description: The face has white eyebrows that extend to the rear of the eyes and a white moustachial streak. Eyes are lemon-yellow. The cere is greenish-horn and the bill yellowish-green. 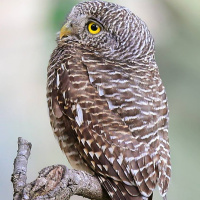 The head and nape are finely spotted pale buff, while the mantle is plain or only weakly barred. The upperside, sides of the head and neck and wing-coverts are dull brown or olive-brown, or faintly tinged rufous, closely barred fulvous-white or dull rufous-white. 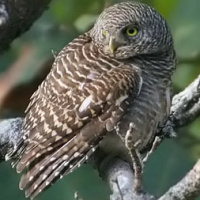 There is a distinct white patch on the throat, while the breast is barred dark brown and dull fulvous-white. 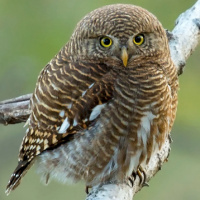 The upper breast has paler brown and pure white bars, the lower part being more streaked than barred. The tail is blackish with about six whitish or pure white, widely spaced bars. Underparts have more indistinct markings. Tarsi are feathered and the toes are bare, sparsely bristled and coloured greyish olive-yellow with chrome-yellow soles. Claws are horn-brown. Size: Length 22-25cm. Wing length 131-168mm. Tail length 75-114mm. Weight 150-240g. Females are usually larger and heavier than males. 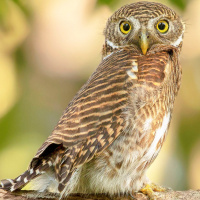 Habits: The Asian Barred Owlet is generally a diurnal bird, often found perched on bare branches or dead tree stumps in the full sunlight, or hunting during the day. 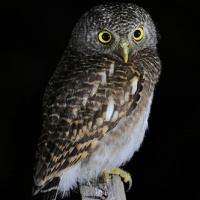 While it may be vocal at any time of the day, it is most vocally active at dawn and for a couple of hours after sunrise. Flight is undulating; a series of rapid flaps followed by a pause with the wings closed. Voice: The song of the male is a variable series of musical notes, beginning softly in a stuttering succession, followed by an accelerating and progressively louder sequence, the notes becoming harsher and more staccato, before breaking off abruptly - kwuhk kuhk-ke-kwuhk kwuhk-kekekwurre kwurre kwurre-kwurrekwurrekwurre...kwur-rekwurr... The pitch varies from 0.9 to 1.3kHz and the rate increases from one note per second to four notes per second. The phrase can last from 5-20 seconds. 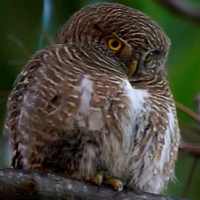 Another common call from this owl is a mellow hoop. 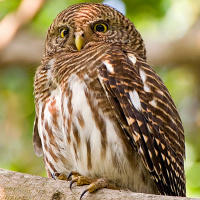 Hunting & Food: This owl feeds on Beetles, grasshoppers, cicadas and other large insects. Lizards, mice and small birds are also taken. 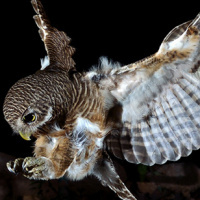 Has been observed seizing Common Quail in the air like a hawk. Breeding: Breeding season is from April to June in Nepal, April and May elsewhere. Fledglings have been found in early July. The nest is an unlined natural hole in a tree trunk or a suitable abandoned barbet or woodpecker hole. 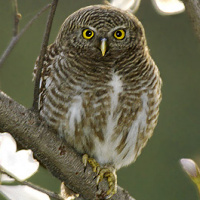 The owl may kill woodpeckers or barbets before taking over their nest-hole. Normally four eggs are laid, which are white and rounded, averaging 35.8 x 30.4mm. Habitat: Open submontane or montane forest of pine, oak, rhododendron etc. Also inhabits subtropical and tropical evergreen jungle at lower elevations. Sometimes near or in human habitations such as gardens, parks etc. 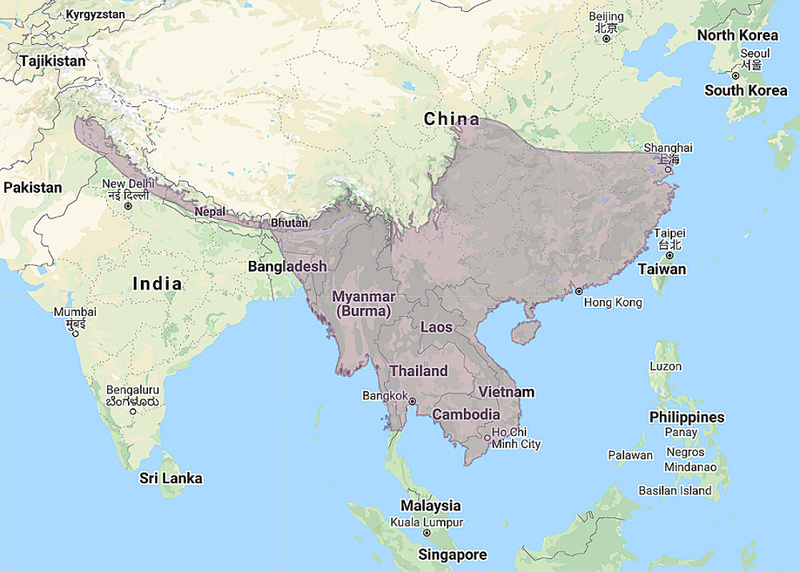 Distribution: West Himalayas of Northeast Pakistan through lower Himalayas east to Nepal, Bhutan, South Assam, Burma and East Bangladesh and across Southeast Tibet, Southeast China, south to Hainan and Southeast Asia. Original Description: Vigors, Nicholas Aylward. 1831. Proceedings of the Committee of Science and Correspondence of the Zoological Society of London (PZS): Pt. 1, no. 1, p. 8.